Fresh eyes on London: Spring on my return? Blossoms. I am looking forward to the warmer weather I will find in London on my return. This was taken just before I left in the gardens of St George in Bloomsbury. A meadow bought by two churches in 1713 as a burial ground. It was unique because this was the first time a burial ground was not part of the grounds surrounding the church. By 1854 it was closed due to lack of space for further graves. The next few years it was abandoned and overgrown until in 1889 as part of a new movement it re-opened as a park and urban space for the poor. 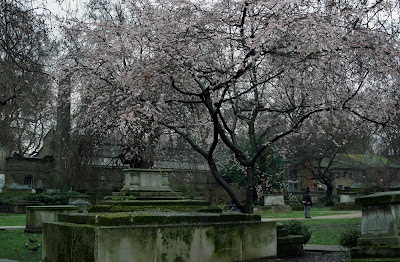 Blossoms in Bloomsbury, what could be more appropriate? Love the fact that it was/is ‘urban space for the poor’! Very nice photo again, Mo. awesome.. love ur pics + words so much. Oh, very nice. Is these a Japanese cherry tree? Beautiful. I've seen a couple of old graveyards that would make great parks. I can "recall" this photo from a hundred movies; I guess every director, while filming a scene where deep emotional sense is needed, would like to film it here. "Urban space for the poor", but obvioulsy with some nice trees! Wonderful that the space was saved! That is very unusual for that time, indeed - a burial ground that is not part of the church ground. I think you'll be pleasantly surprised on your return. The sun has been shinning and its been quite warm. Blossoms will be blooming! Good weather, flowers open, it creates a warm space. 'a park and urban space' i like it, it's a favor of God for the poor. God bless all of us. Don't jinx it!! We have so many false springs in London, don't we. I believe we called the last big one "summer 2008". Oh my God ! I'm not able to believe. A burial ground turned into a park.